In the run-up to his presentation at this Saturday’s free Anatomy Lab event at Gnomon School of Visual Effects, sculptor Steve Lord provides his tips for creating believable creatures – from real animals to mythical beasts. Steve Lord has been sculpting professionally since the age of 19, winning the National Sculpture Society competition for young sculptors. Since then, he’s worked for entertainment industry clients as diverse as Rhythm & Hues, Oddworld Inhabitants and Frank Frazetta. His work ranges from fine art and public commissions to videogames and themeparks. 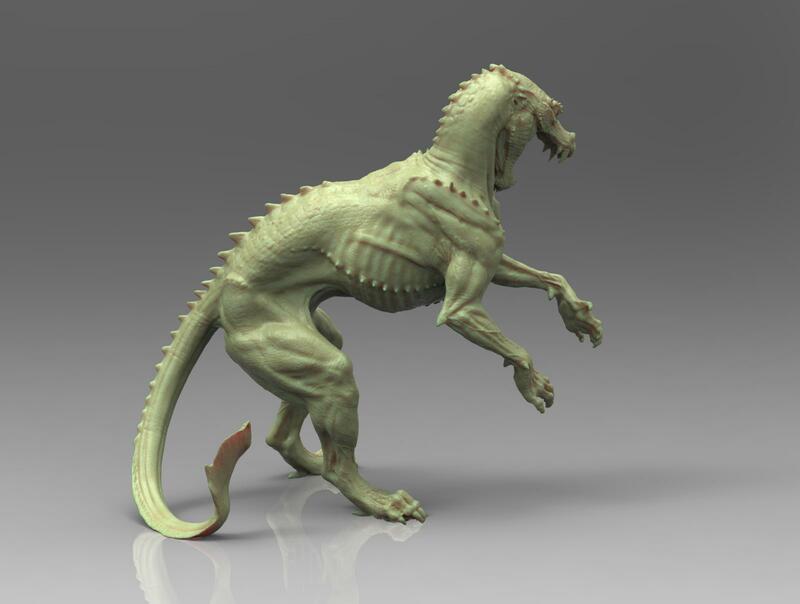 He is currently working for McFarlane Toys, sculpting a variety of highly realistic collectible figures, and in 2014, successfully launched a Kickstarter campaign to fund the manufacture of a canine anatomy sculpture. On Saturday 25 July, Steve will be sharing some of his knowledge at Anatomy Lab: a free four-hour event at the Gnomon School of Visual Effects’ Hollywood campus, also being streamed live online. As a taster of what you can expect, we asked Steve to provide five tips for sculpting believable creatures. Ever wanted to know how to find reference of a kudu, or what size to make the wings on a dragon? Then read on. 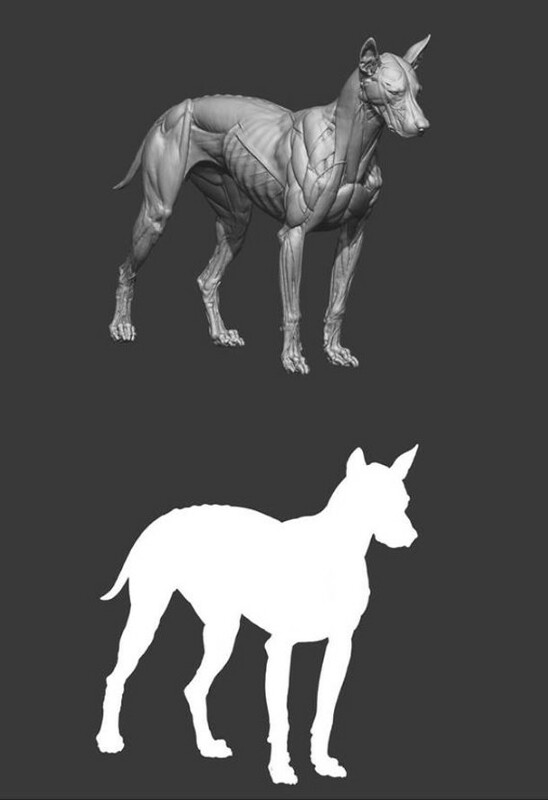 The key to sculpting believable creatures is to have an understanding of animal anatomy. Okay, you’ve probably heard that before – but what does it really mean? You can get great books that show animals in static poses (I’d recommend An Atlas of Animal Anatomy for Artists or the more recent Animal Anatomy for Artists), but static poses don’t tell the whole story. How do the muscles, tendons and bones react when a horse is galloping, or a lion is attacking a gazelle? That’s the level you need to reach. Getting a real understanding of what goes on underneath the skin – the origin and insertion of muscles, particularly the deeper muscles – is important in any kind of anatomy work, whether human or animal. Once you have a grasp of real anatomy, you can manipulate it to create believable creatures. Research anatomy in detail. Click the image to see a larger version. Suppose you want to sculpt a kudu. Think you can’t find any anatomy references? Wrong. You can find references in the books I just mentioned. Just use the deer or the cow: they’re both similar ungulates. First, find side views of the kudu and line up the basic anatomy: the shoulderblades, pelvis, skull and so on. Then match the muscle and skin to the skeleton and silhouette. Want to go further? Find dissections of goats or deer to see how the muscles look and interact. Then find YouTube videos of kudu or similar animals running around to see how the joints look, and how they interact with the muscle. An accurate silhouette is the key to any believable sculpt. The silhouette of your piece is more important than you might think. It tells the story before you even see little details like skin pores or wrinkles. The silhouette can tell you whether a muscle isn’t bulging out enough, or whether a leg is positioned incorrectly, or whether an area just looks dead. I try to look at the silhouette on a regular basis to keep me honest. Don’t get bogged down with one area: keep rotating your piece. 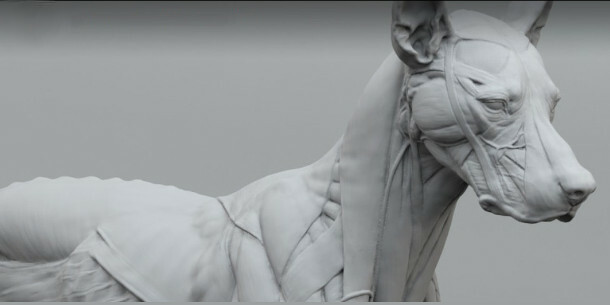 This is one aspect of sculpting on the computer that has enhanced my abilities. You can’t exactly spin a five-foot traditional sculpt weighing 300 pounds around. Keep your poses alive: don’t overuse the symmetry function in your sculpting software. However, there is one thing about digital sculpting that I believe stifles understanding, and that is the symmetry option. If you have it on all the time, you don’t learn to train your eyes to see and measure properly, and it makes poses look stiff when you try to bend body parts into position. I know it’s an important time-saver, but I would recommend turning it off and practising your hand-eye coordination whenever you can. Better still, get a piece of clay and sculpt something once in a while: it will only make you a better artist. 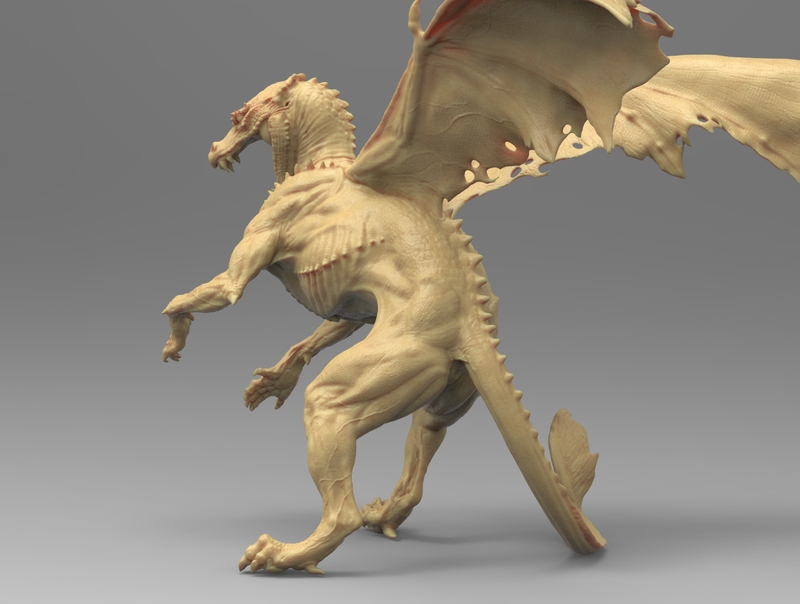 Understand the laws of physics before you break them, as with this dragon’s wings. How does your creature propel itself? What energy does it use to move? Ask yourself these questions when sketching out creature designs. If your creature is too far removed from real-world physics, you lose believability. Viewers might not know why your creature doesn’t work, but they will feel instinctively that it doesn’t make sense. That doesn’t mean that your creatures always have to obey the laws of physics: just that you need to be aware of them. I once sculpted a dragon and I knew full well the wings were too small to support its weight, but I made the decision to keep them small regardless. Just make sure you make the choice consciously, not by accident. You can see Steve discuss his work in more detail at Anatomy Lab at the Gnomon School of Visual Effects’ Hollywood campus this Saturday, 25 July. His session runs from 12pm to 1.45pm. Steve’s talk will be followed by a session from movie concept artist Ian Joyner. Both presentations will be streamed live online, so if you can’t make it to LA in person, you can watch them via the link below. 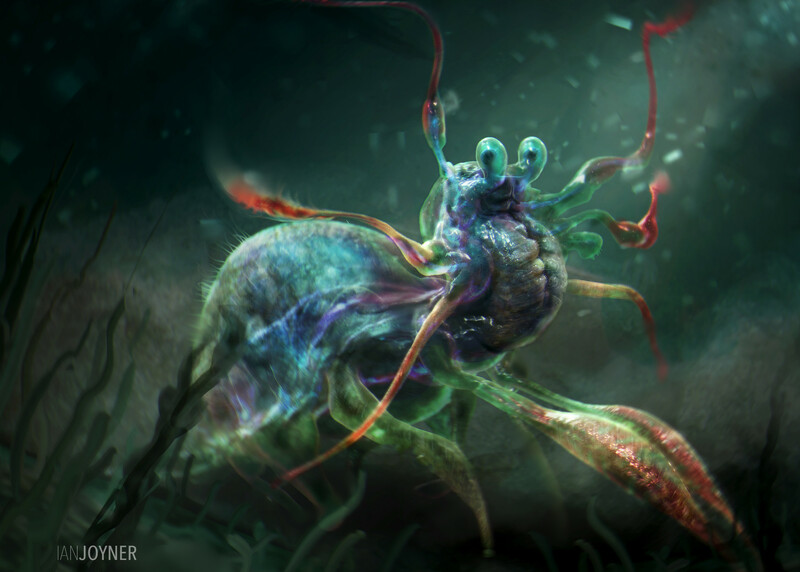 Jelly Shrimp by Ian Joyner. Don’t overdo detail, Ian advises. Let some areas of an image rest to sell the overall concept. Updated 23 July: Steve Lord’s co-presenter at Anatomy Lab, Ian Joyner, provides a couple of excellent extra tips of his own. A veteran of Blur Studio and Legacy Effects, now working freelance, Ian has worked on a range of films, games and commercial illustrations, with a credit list including The Amazing Spider-Man, The Avengers and The Hunger Games.